Power(s) given Shoot fire rapidly. The Fire Mini Marios are what Mini Marios become when one touches a Fire Flower in Mario vs. Donkey Kong 2: March of the Minis. By transforming into this, the Mini Marios will be able to shoot fire rapidly for a short time. This also applies on Mini Toad, Mini Peach, Mini Donkey Kong. This can be used to topple a Capture Kong freeing any trapped Minis. On certain levels, a form of teamwork can be employed where one Mini hits a ? Block, which gives the Fire Flower to a Mini waiting above. 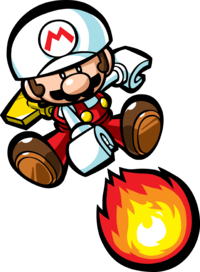 Fire Mini Mario appears with red overalls and a white hat and shirt, just like Fire Mario as of Super Mario World. Fire Mini Toad's cap colors are reversed (the cap is red with white spots), as well the blue on them turns red. The color scheme of the toy is similar to Super Toad's from and Toad's old color scheme in the first three episodes from The Super Mario Bros. Super Show! Fire Mini Peach has a white dress (with some red on it), and orange hair. The color scheme of Fire Mini Peach is based on Peach's color scheme in Super Mario Bros. and the hair color of Fire Mini Peach is similar to Peach's hair color from the DIC cartoons. Fire Mini Donkey Kong has white fur. The color scheme is similar to that of Super Kong's (except the tie which is blue for Super Kong) from Donkey Kong Country Returns. This page was last edited on February 19, 2019, at 20:28.